Commercial fishing is an agricultural industry involved with the fishing of a wide range of forms of edible marine life, including true fish, but also crustaceans such as shellfish, invertebrates such as squid and octopus, and seaweed. It is done in both fresh and salt water. It may be extended to include aquaculture, or "fish farming". The sea is both a provider and enemy. Commercial fishing, even in industrialized countries, is among the most physically dangerous occupations. 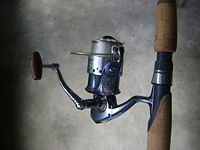 Fishing boats and equipment are designed for specific fisheries (i.e., types of catch), and need skilled sailors to operate. Still, extreme weather, collisions, fire, leaks and other hazard sink or disable many boats. Since the resources involved can be regional or worldwide, there is a significant interest in fisheries monitoring surveillance and control to ensure sustained yields. This page was last modified 06:50, 14 July 2009.